We last went to Germany in the 1970s in a worldwind tour of the Black Forest. 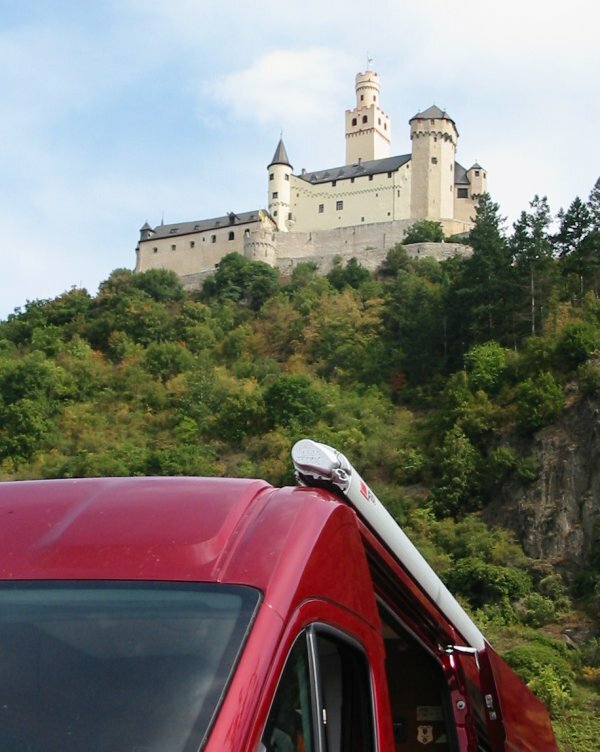 We thought it time we returned, so in August 2012 we set out to follow the popular Mösel and Rhine river routes. 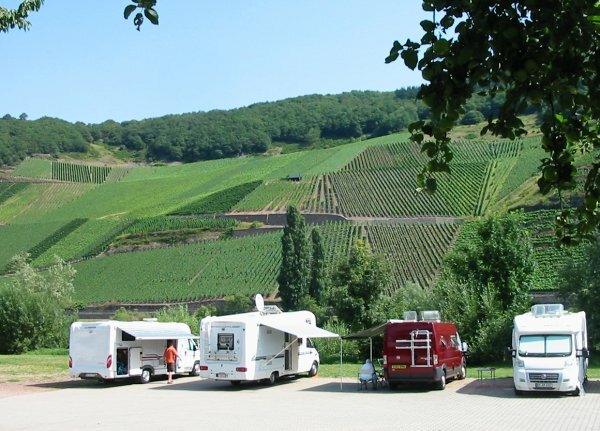 We were also keen to find out if the motorhome Stellplätze parking areas were as good as folks say. 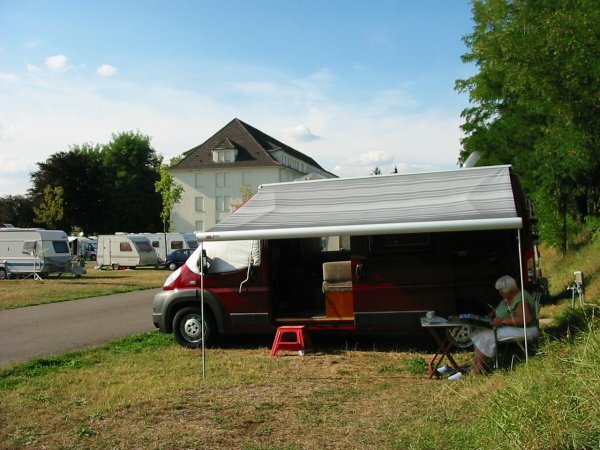 The Stellplatz is like a French Aire de Service for camping-cars but, unlike the aire, one can usually legitimately put chairs and tables out. 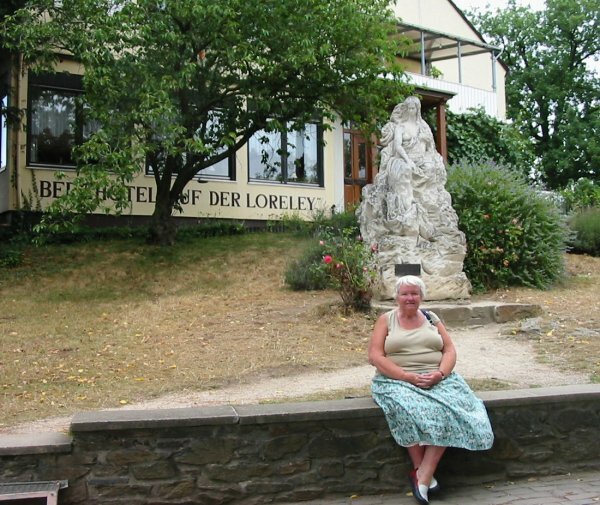 There is a vast network of Stellplätze, we found some were free and those where we paid were around 5-8 Euros per night, usually including water and chemical disposal. Some had electric, which may have been extra and metered, but we didn't need it. 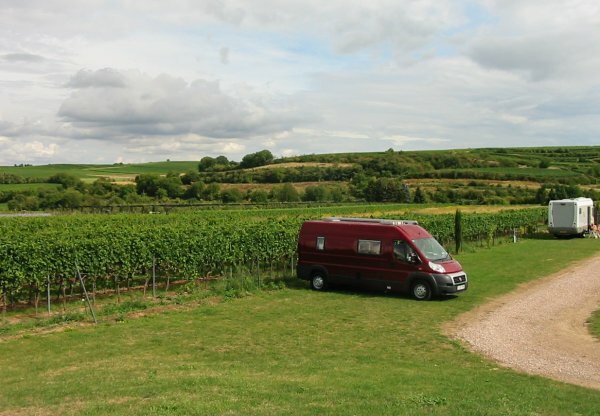 Surprisingly, we saw very few Brits in Germany; it's a great place to go in a motorhome and certainly different. The Bord Atlas. A4 in size and an inch thick - it's heavy! 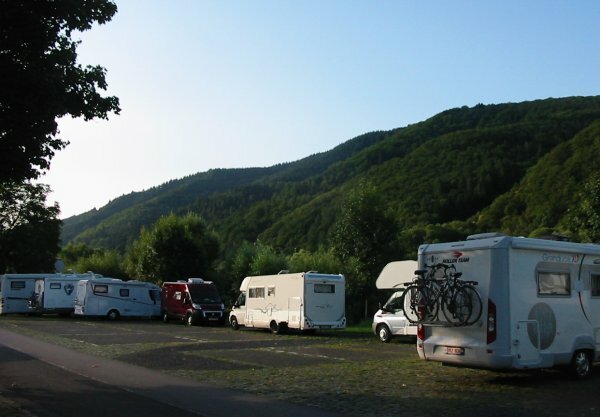 Over 5,600 entries covering the whole of Germany; a mix of Stellplätze, campsites and parking places suitable for a motorcaravan. 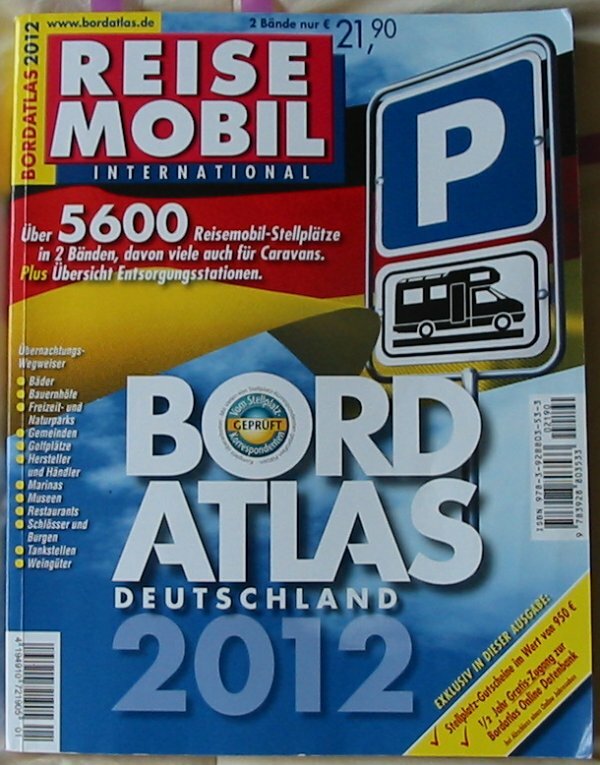 Written in German it has good clear maps, easy to follow very detailed entries with explanatory symbols (with a key in English). Along with Michelin maps, this was all we needed. Obtained from www.vicariousbooks.co.uk, it comes with a companion volume (not quite so exhaustive) of stopping places in other Euro countries. ...we awoke to find a car boot sale in full swing in the parking area adjacent to the site. We'd not heard a thing! ... 40.7 degC. Or 105degF! This with all the doors and vents open around mid-afternoon. The Belgians in the white van next to us had 38degC. 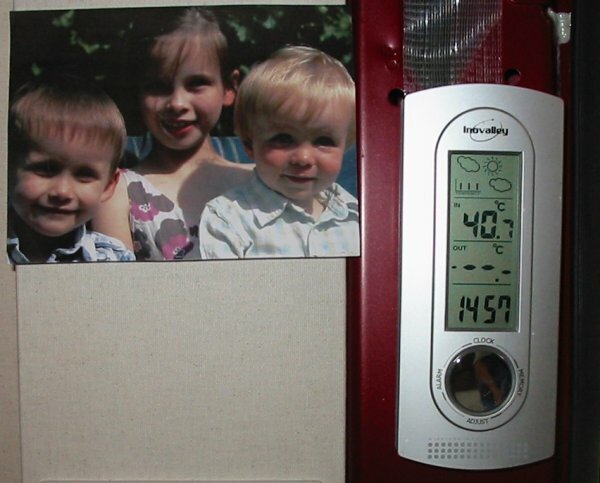 on their thermometer. This temperature lasted two days and then dropped to around 25-28deg C. average. Coloured vans do absorb more heat than white ones, so a paint expert told us some while ago. The Fiamma awning was a godsend. 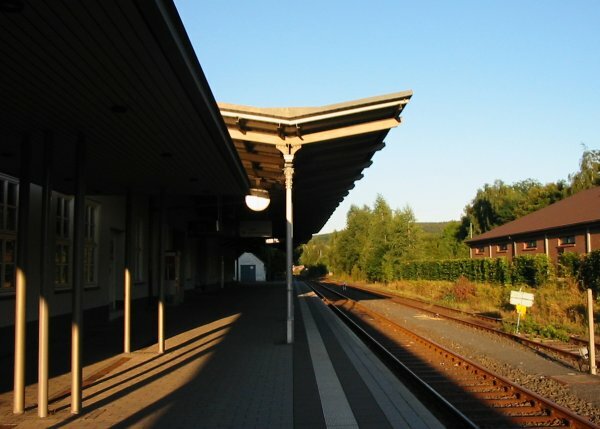 ←The stellplatz at Ediger-Eller. Right by the Mösel in the centre of a very pretty village. There was a campsite adjoining that look very busy. 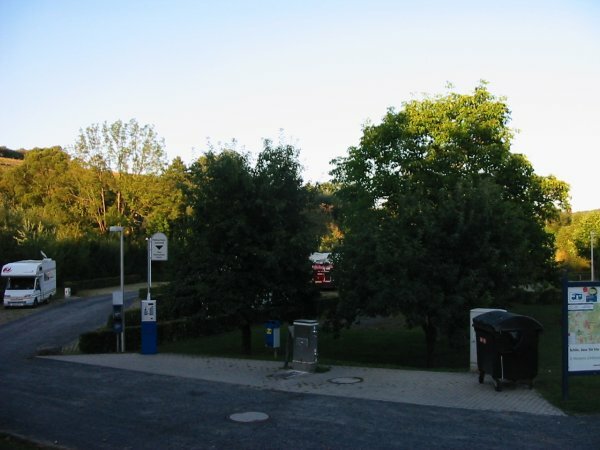 This shows the difference in Stellplätze one encounters, here more like a car park with just a water tap (a man came round to collect the 4.50€ fee each evening, there was no electric). To empty the waste tank and loo one had to go to the garage 200 yards down the road and lift a drain outside their car showroom (fee 1.50€)! ... it's a railway station! In fact, a branch line terminus and with only three diesel commuter trains an hour that were barely audible. 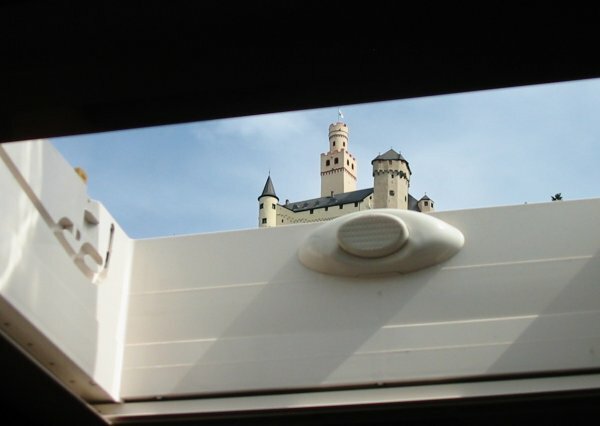 Typical Germanic order: the business end of the Bad Wildungen stellplatz. Water dispensed from the bollard in the centre (cost one euro), grey water and chemical disposal alongside (free). Domestic waste in the large wheely bin on right with detailed notice board to help the visitor find their way around. On left, a box fixed to a pillar has a notice that asks campers to please take and complete a questionnaire sheet and post it in the lower post box! The Eder Dam. One of the three dams targeted by RAF No. 617 Squadron (The Dam Busters) on 16-17 May 1943. 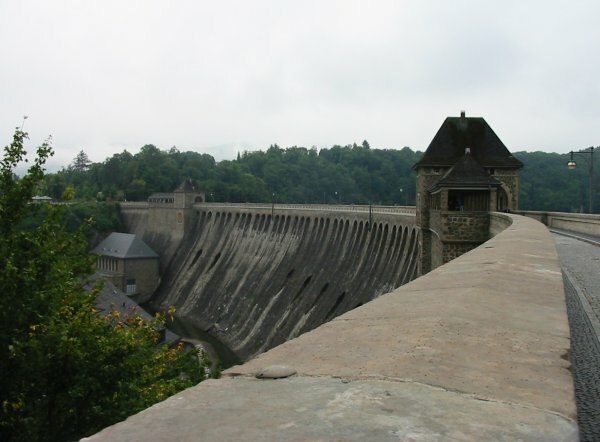 This dam was breached; today one can clearly see a part of the centre section has different coloured stonework where repairs were subsequently made. The dam is surrounded by steep wooded hills which made the bombing approach of the Lancaster aircraft (flying at 60 feet) very difficult. 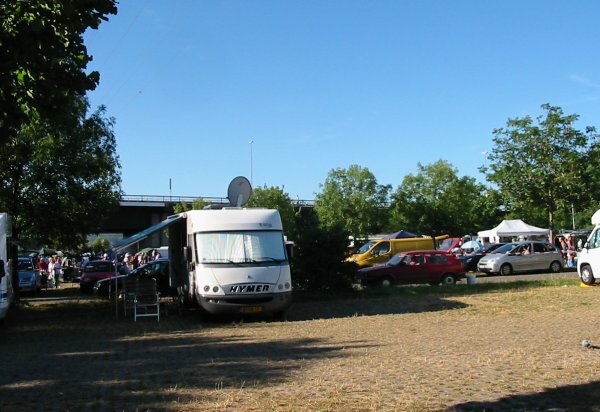 Busy campsite at Möhnesee. Möhne Reservoir - a huge lake some 17 miles long and a very popular area for water sports. The Möhne dam is a few miles to the left in the picture. 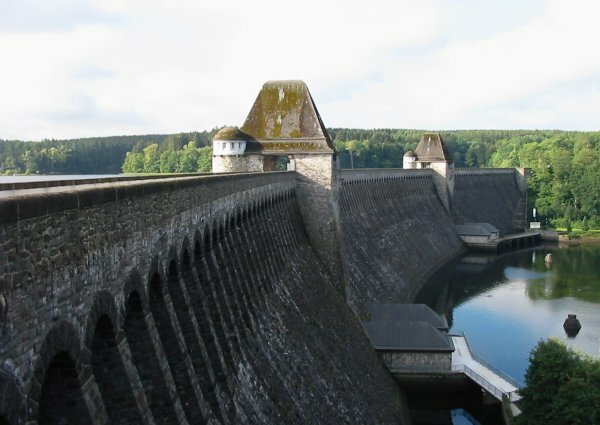 The Möhne dam. First of the three dams targeted by RAF 617 Squadron. Such attacks on Dams are now outlawed by the Geneva Convention. This was odd! 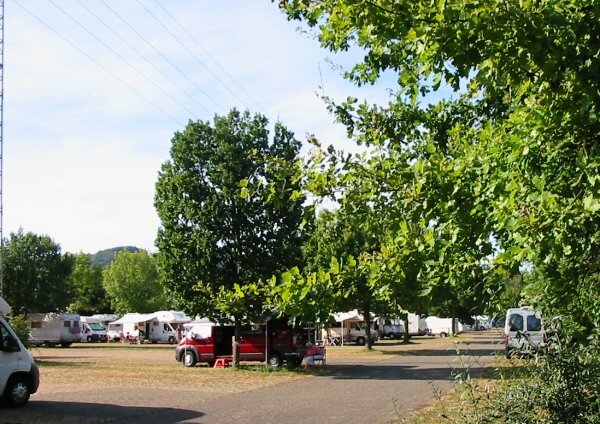 In the small village of Merenberg was a campsite and a stellplatz. We never found the stellplatz. 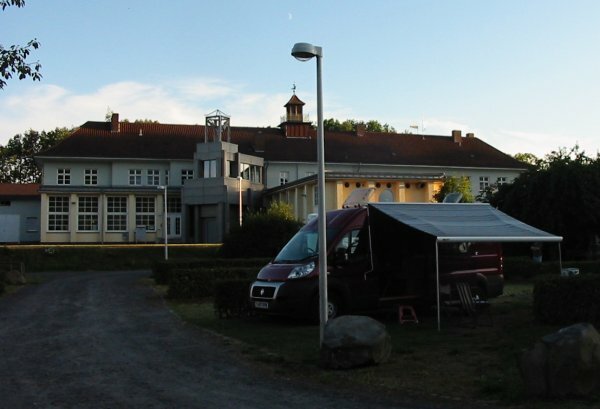 We did find the campsite which also had a gasthaus. 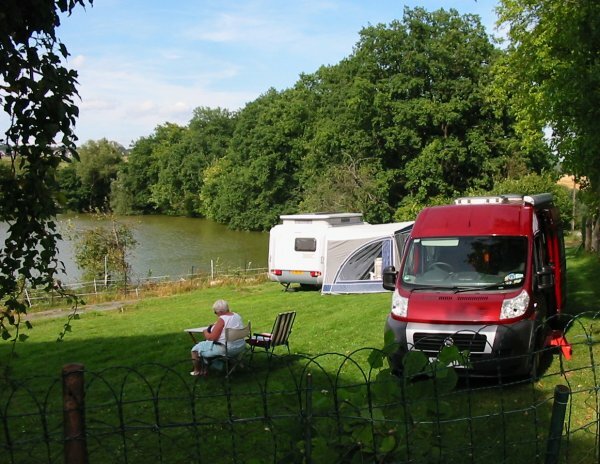 The lady asked if we'd like to be by the lake; we said yes and she pointed to her garden - where there was just one other camper! Mad Mumsie, I think we're overlooked! ... and here it is. 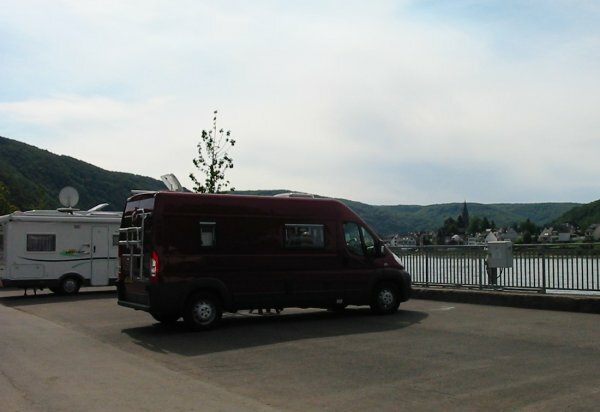 Right by the Rhine with great views of the river. ... a railway next to the road and stellplatz, and a very busy railway at that, and it carries long goods trains as well as passenger services and they run 24 hours a day; and because the line is right next to the stone cliff the sound of the train bounces off the rock, and the noise is very loud and it is difficult to hear someone speaking, let alone sleep, when a train goes by! 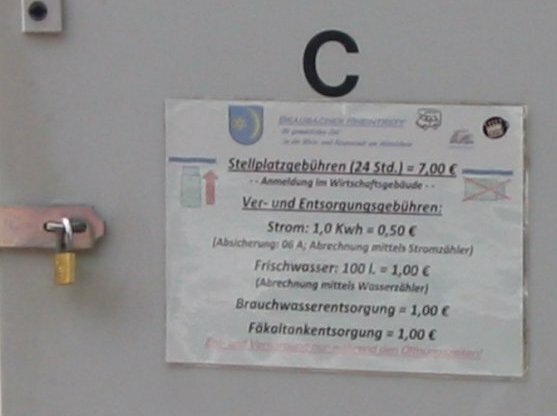 Still at Braubach, instructions pasted to the electric bollard show the right way to park and prices: Fresh water - a Euro; Waste water - a Euro; Chemical waste, you've guessed it - a Euro! Reminded me of the film Carry on Camping where everything was a pound. 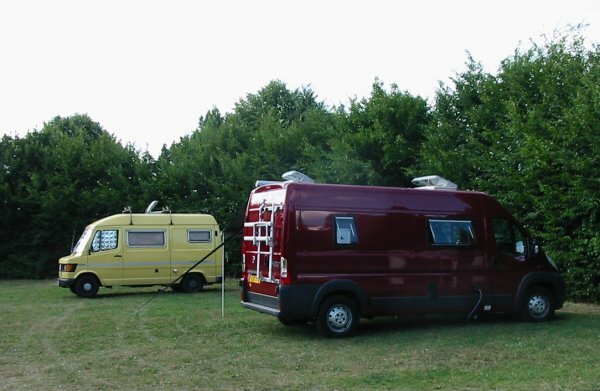 A rare sight in Germany - another self-build! Pretty Merc-based van and fairly old, I believe. It appeared to be in very good order. 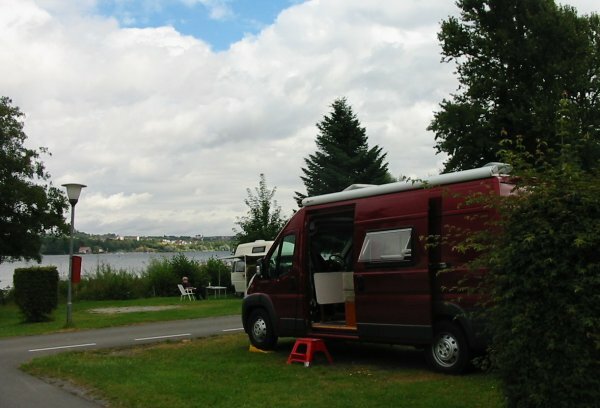 View from campsite at St. Goarshausen. It was the only site we found using the Caravan Club book. 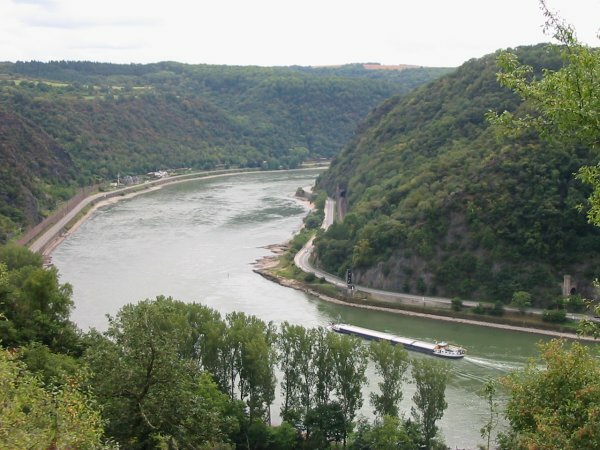 It's located close to the top of the Loreley rock overlooking the Rhine. (Technically, this is an awful pic). Mad Mumsie at the top of the Loreley Rock. The statue (the object in white!) 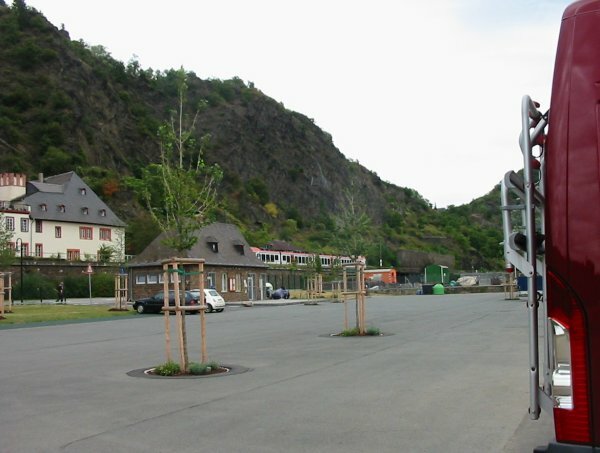 depicts the siren, Loreley, who, according to myth, distracted boatmen on the Rhine 125 metres below causing their boats to crash on the rocks. The river is at its narrowest point below the rock and there are treacherous currents and hidden rocks. Major accidents still occur there. However, what intrigues, and is of interest to a self-builder, is the position of the gas fridge upper exhaust vent immediately below the opening window. Where do those poisonous combustion gases go on a hot day when the fridge is working overtime and the window is open? At the Technik Museum at Speyer. 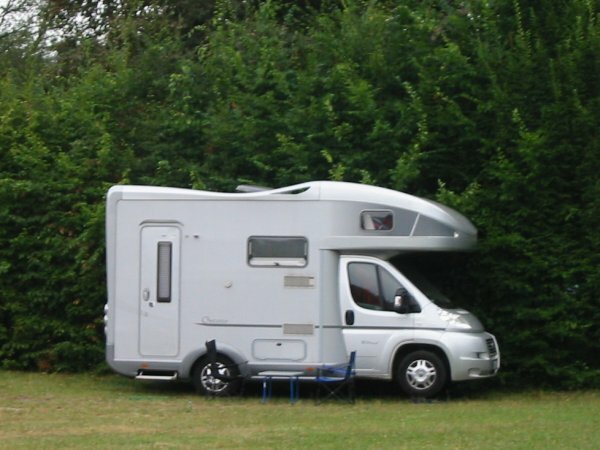 The secure campsite was in the grounds of the museum and just a short walk across a car park to the museum entrance. It cost 22 Euro per night, well worth it for the convenience if one is unable to walk far. 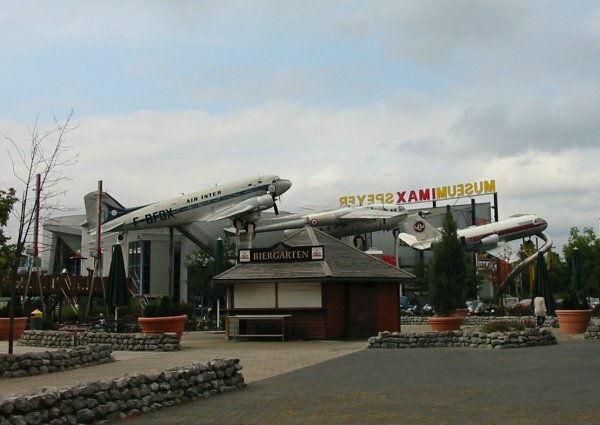 The museum entrance. Yes, they are genuine aircraft. My favourite aircraft is the DC3 (Dakota) - and there's one on the left! This is truly an amazing place and put together with great skill and imagination. 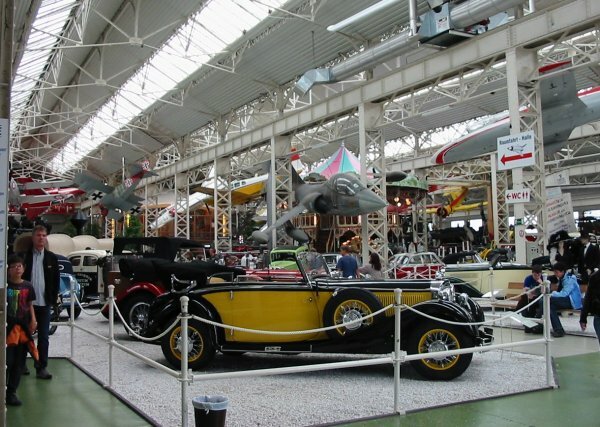 See http://speyer.technik-museum.de/en. 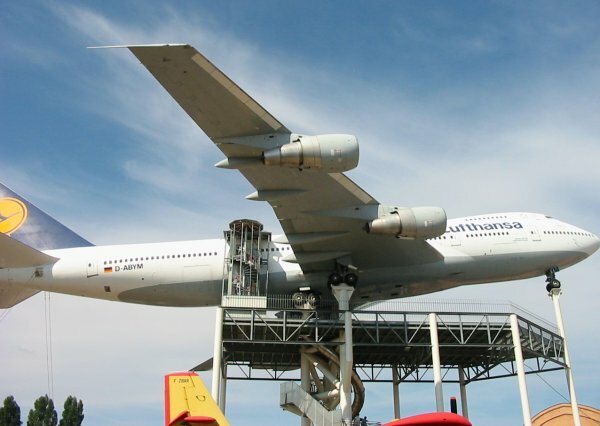 A Boeing 747 'Jumbo' jet - on stilts. Yes, one can go inside and even walk on a wing - if you have a head for heights! The museum occupies a large area and has several very big halls - this is the main hall. It has just about anything to do with transport: aircraft, space shuttle, cars, locomotives, motorcycles, U-boat, boats, models, and so forth. It also has some wonderful fairground/music organs (that work) and much else including costumes and period furniture. There is plenty to occupy the ladies and children. Cost us 13 Euro each per day (one euro discount each as we were camping!). 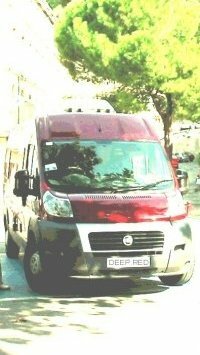 An Umwelt Plakette in Deep Red's windscreen. A growing number of cities in Germany have Low Emission zones. 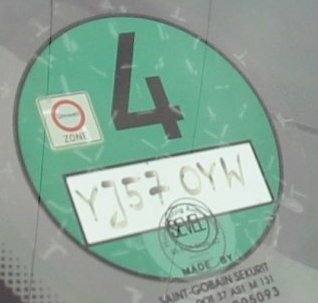 Vehicles entering these zones must display an emission badge or risk a fine. There are different types of badge depending on a vehicles' engine emissions. Deep Red is a Euro 4 category diesel, so we got a green badge. One can buy these online in advance, or wait until one visits Germany and go to any main car dealership, repairers, or a Tüv (Mot) station and buy them there (cost about 5 Euro). Note: one will need to show the V5. If passing through a zone staying on motorways, a badge is not required. A badge is not transferable, it is made from very thin, sticky plastic and cannot be removed without destroying it. Once issued, it lasts the lifetime of the vehicle. We got ours online, but paid over the odds for it. We don't know of any websites with low prices.